Welcome to Amazing Wristbands! We’re the ultimate destination for all types of customized silicone bands that can be specially designed to suit your requirements. Durable, long-lasting, comfortable, non-allergenic and latex-free, our silicone wristbands are a simple, versatile way of expressing a message while looking stylish at the same time! We all love expressing ourselves, our personality and our interests, and what better way is there of doing so than getting your very own cool wristbands to wear? 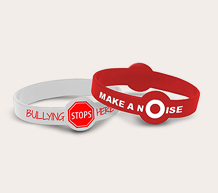 Whether you want to advocate a cause that’s close to your heart with awareness bracelets, support your favorite team or band, or simply display a message that has a special meaning to you, you’ll be able to do so with our quick, convenient personalization service. Want to promote your business? 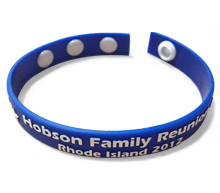 Personalized wristbands are also a cost-effective way of marketing your company! Whatever kinds of silicone wristbands you’re looking for, we’re sure you’ll be impressed by the wide range of awesome products available here. Extra wide or extra thin bracelets, debossed or screen printed and many more - simply have a browse and see which style suits your needs and your preferences best. We’ll then work closely with you from conception of your idea to completion of delivery, to ensure that you’re perfectly happy and kept in the loop at all stages of the process. FREE Artwork, Color Matching, and Design Help! Why choose us? Glad you asked! We’re superior to the competition for several reasons, and we’re sure we can get your wristbands to you more quickly (and more cheaply!) than other retailers. You might see deals that are too good to be true from other stores, and invariably they are! With us, what you see is what you get. That means absolutely no hidden charges, for a company you can trust. Sound good? Thought so! 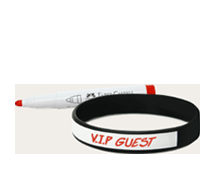 Getting customized, high quality wristbands doesn’t have to be tricky any more. Get in touch now; we’re looking forward to helping you out. *Request a quote and based on our business hours, we will get back to you as soon as we can. You will probably hear from us within 24 hours, but don't be surprised if we get back to you within a few minutes. **Standard production time plus delivery time for orders under 10,000 pieces is 10-12 business days, Monday - Friday.